As every month passes faster broadband services varying from VDSL2 to full fibre are being rolled out across the UK and while no one minds if companies are spending their own money and no one is buying the faster services with the gap funded roll-outs and various voucher schemes that are using public money keeping an eye on the speeds across the UK is an important one. 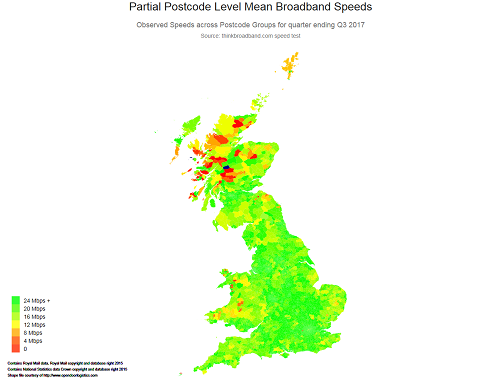 The Q3 analysis of speed tests for local authorities was published just after the end of Q3 on our statistics site but at that level a lot of the detail is lost and therefore we are publishing a summary for the average speeds per postcode area in Q3 2017. The map showing the average mean download speeds is a nice see of green and perhaps the scale should be adjusted, as otherwise people viewing the map will get the idea that all is well, but if one looks at the same dataset but plotted using the median download speed you can see a distinct difference and areas like Central London don't look as good. So is the mean map wrong? No, its just that those who have the option and are actually buying the fastest services available to them are skewing the mean. The link between availability and average speeds is explored after we look at the fastest and slowest 30 postcode areas and with the upload speeds included the asymmetry of consumer broadband services is clearly illustrated. 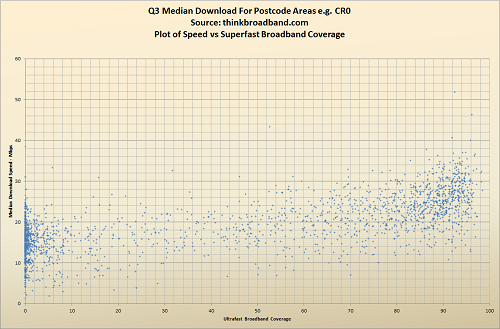 The range of speeds is very wide and the median speeds at the foot of the table look like ADSL speeds from a decade ago and that is perhaps no suprise when SA39 has no ultrafast coverage and only 54.7% of premises with access to a superfast option, some people are clearly buying and testing the superfast option as reflected in the mean figures, but while some people will be on the phone ordering better broadband options the minute a service is available, others take time to spot that a faster option is available and may be put off by some of the upgrade costs, though we should highlight that for people in rural areas on older up to 8 Mbps ADSL only services the monthly price of VDSL2 services can be less so don't just rely on a quote from your existing provider. On some of the other slowest areas, LD6 47.2% superfast coverage, NE67 58.4%, SA41 59.9%, SA48 57.6%, PH15 21.8%. 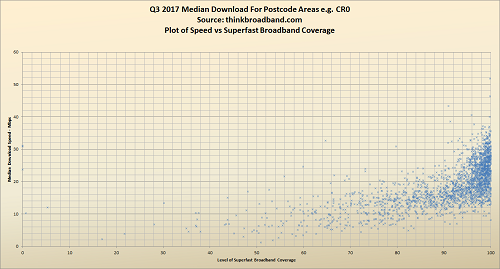 A number of studies and spreadsheet re-ordering exercises in 2017 have published name and shame tables on broadband speeds, but none have published charts (that we know of) showing how the speeds observed from consumer speed tests correlates to the levels of superfast coverage and with our wealth of consumer speed test data and tracking the path to 95% superfast coverage and beyond that is pretty easy for us. 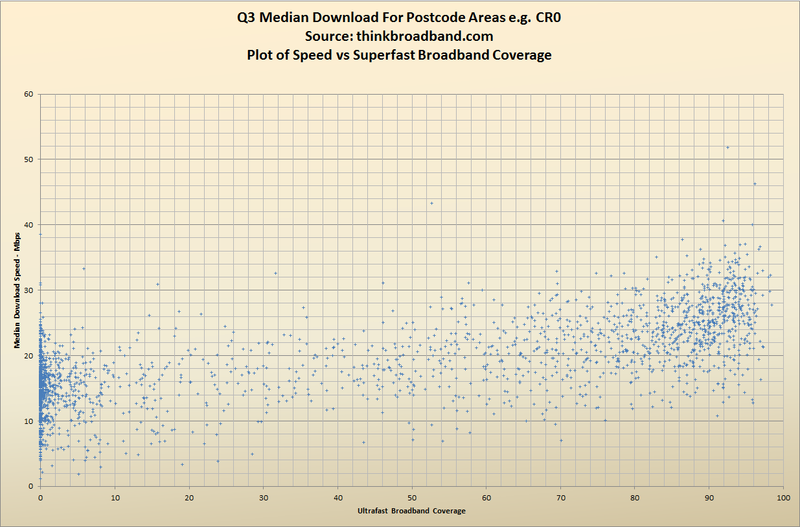 The chart conveys two messages that there is a link between superfast coverage and the median download, this is of course not rocket science but there are some areas such as PO41 with 83.6% superfast coverage recording median download speeds of just 5.6 Mbps suggesting that maybe the area has only just seen coverage increase significantly or take-up is lagging and if public money has been used to boost coverage increasing take-up is important as the higher the take-up the greater the gainshare money available to take coverage ever closer to 100%. The big cluster of postcode areas in 98% to 100% area is a reflection of the superfast roll-outs, and the broad spread of speeds down to the popularity of the ultrafast broadband options. The chart of ultrafast coverage against download speeds has three main areas, those with no ultrafast broadband coverage on the 0% line with the spread showing the variations from take-up and observations, through to those areas with over 90% ultrafast availability which unsurprisingly are faster. 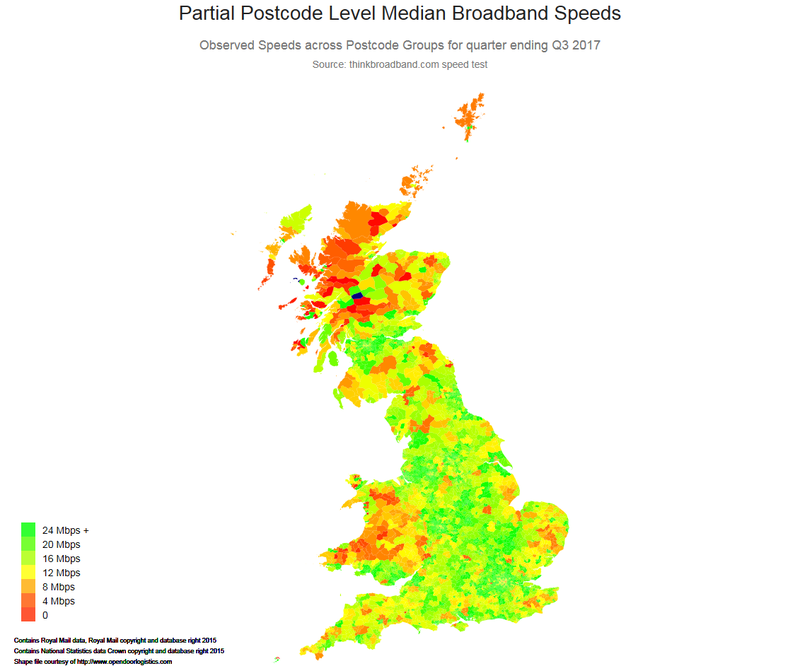 The middle ground shows a slow but steady trend towards higher speeds, what is interesting is that the postcode areas with ultrafast coverage below the 10% mark tend to be those with Openreach GEA-FTTP coverage and one observation we will make is that two years ago it seemed as if more people were buying the faster 200 Mbps and 300 Mbps variants whereas in the last few months the number buying the fastest FTTP options has reduced, we suspect that poor visibility for these faster services on many comparison websites and pressures on utility spending for many, leading to people buying something sufficient for their needs, i.e. with full fibre if you buy a 38 Mbps or 50 Mbps product with distance having no impact you will be able to stream multiple HD streams (assuming the provider does not have massive congestion issues at peak time). As for the list of over 3,400 postcode areas we have data for, the full list is not available but if you want to see some more information on your specific postcode you can search for your postcode code on our statistics site which updates coverage percentages weekly, area speeds every quarter and the 12 months of history for a postcode and its immediate area updates each month. For the local authority areas, the speed analysis is broken down by technology so you can see the relative speeds of ADSL, FTTC, cable and FTTH services in an area. I am in a rural area of Scotland around 3000m from the nearest cabinet and am on the "BT Faster Broadband" package which I believe is enabled as up to 40/2. What I actually get is 7.3/0.8 but the good thing about it is that it is very, very consistent. Any time of day I get just over 7MBs down. Off-peak or the evenings makes no difference. It is absolutely fine for a single YouTube 1080p stream, online shopping and so on. As long as I am careful about when I do Steam downloads, I don't feel too left out. The UK seems to be missing a large chunk of land across the Irish sea. The map is has the correct Great Britain name, alas no postcode area e.g. BT10, BT67 for Northern Ireland is readily available, so for the map plot can only manage Great Britain for this dataset. The BT postcodes do feature in the table, hence article UK title.